Transformers Prime Season One is here on Blu-ray, and this is my ever true Blu-ray review! And yeah, they look NICE on a high definition screen. So if you haven't read my review of Transformers Prime - Darkness Rising, that's fine because this release contains those first five miniseries episodes titled Darkness Rising so I'll be able to get you caught up. Transformers Prime is a computer-generated animated show, and boy has it come a long way since Beast Wars. The computer artwork is amazing, both on the intricately detailed Transformers as well as on the environments. The Transformers often show signs of real life, with textures and dirt, scratches, dents, and the like. 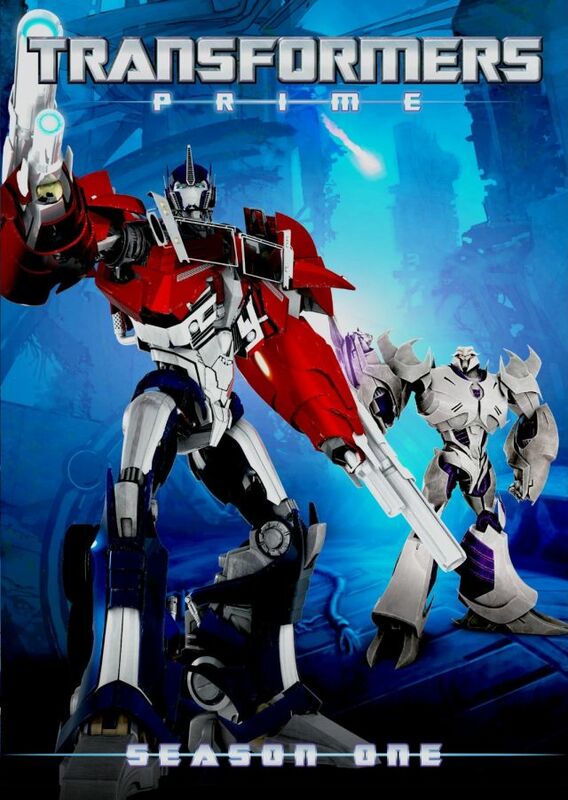 Any fan of the original show will be thrilled to hear Peter Cullen and Frank Welker are back reprising their original Generation One voices of Optimus Prime and Megatron respectively. You may also recognize Ernie Hudson as the primary adult human character Special Agent Fowler, Jeffrey Combs as Autobot medic Ratchet, Kevin Michael Richardson as Autobot strongman Bulkhead, Steve Blum as Decepticon Starscream, and Dwayne Johnson as Autobot Cliffjumper. Of course there are many other voice actors and all do a wonderful job, those are just the ones that I recognized. This is a much darker version of Transformers than any of the other incarnations I've seen, and to let you know what I mean I'm about to reveal a spoiler, so if you don't want to know then skip to the next paragraph now! Okay, are you ready? In the first episode, Cliffjumper ends up in a heap of trouble surrounded by Decepticons, and even though he's one tough dude, he is overwhelmed, captured, and then killed dead by Starscream! Yes, dead. Okay, he comes back briefly as a zombie, but that doesn't last very long at all and other than that he only shows up again in flashbacks. So right off the bat this show demonstrates that anything could happen. In addition to Transformers, there are three human kids who accidentally get mixed up with the Autobots, 16 year old Jack Darby, 15 year old Miko Nakadai, and 12 year old Raf Esquivel. I think this was a good call, as each of the kids has a different age and different personallity, giving kids who watch the show the ability to identify with one of them. Then there's also Special Agent William Fowler who shows up from time to time, and at first I thought he was going to be the parental figure in the series, but it turns out that the kids' Autobot guardians are actually more of parental figures than Fowler. What's not to love here? There's action, adventure, comedy, and even a season-long story arc. I was a bit disappointed that no other major characters were killed off during the season, despite having several good opportunities to do so and bring in new characters. I also hate how Bumblebee can't talk. I know they did this in the comics and of course in the live action films, but why'd they have to continue with it in this series? We know what he says based on how others respond to him, but that's just annoying. These are just minor nitpicks of an already great series, and I'm really looking forward to seeing season 2. The Limited Edition Blu-ray box set includes 4 Blu-ray discs and a 96-page Transformer: Prime graphic novel, and a few bonus features which are cool but nothing to write home about. There's a making-of featurette, and featurette about the toys, and several of the episodes have audio commentaries.